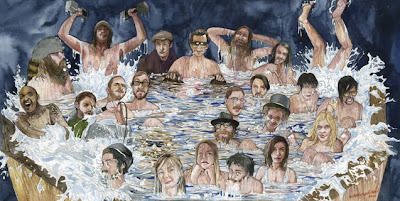 Hmm, let's think about this for a minute: Megafaun and Rosebuds (whose members are in the supergroup) are all in North Carolina right now, though Justin Vernon is technically on a break from touring with Bon Iver. Har Mar Superstar just went back to L.A. and P.O.S. is in Austin. So basically, that leaves Ryan Olson, Channey Moon Casselle, Adam Hurlburt and Zach Coulter from Solid Gold, and Mike Lewis, and Jake Luck of Leisure Birds, and just maybe Bon Iver's Justin Vernon and Mike Noyce if we're lucky. Could this be GAYNGS 2.0? UPDATE: Ryan Olson confirms the posting to us via email, saying "We are doing a 3pm gayngs sunday brunch practice at nick n eddie. Also Habenero (sic)." We're so in.